Day 1 in Meteti: After a 4 hour bus ride from Panama City to Meteti in the Darien province, we finally arrived at the school to meet the kids that we would be working with for the week. At this time, it is summer in Panama so the schools are not in session, but our workshop is organized like a summer program that kids can choose to attend. We were overwhelmed by their warm welcome at the school’s gate: “Bienvenidos a Meteti!” Their enthusiasm was much needed encouragement for us as English speaking teachers who had just gotten on our feet again after a long bus ride. We later found out that some of our students had walked over an hour to get to the school to take our classes, and the ones that were there had waited over an hour for us to arrive. What dedication they had to an unknown art! Their positive energy that greeted us at the entrance gate was matched in the classroom. The students in this province have never been introduced to classical, organized dance forms and visitors rarely visit their remote town. However, they were very accepting of us as instructors and were open to trying all of the steps that we began introducing them to. While some were hesitant, they slowly warmed up to us and were quick to take our hands and dance across the floor with us. It was amazing to see how dance can begin to bring people of different cultures together so quickly! Day 4 in Meteti: By this time, we have really begun to develop a comfortable relationship with our students and fallen into a wonderful daily routine with them. Many of them arrive early to see us warm up and get themselves ready for class. We are greeted each morning with warm hugs and smiles. Throughout the week, we have noticed some fluctuations in energy levels, as expected, but the overall enthusiasm and joy has not changed. They are very interested in us as instructors and people, asking more about where we are from and our language. Most of the students understand that our knowledge of Spanish is limited and work hard to understand us and teach us new words. The students are learning new material very quickly and we are all beginning to have much more fun in our comfort with one another. Plies, tendues, degages, and battements—the kids love learning new steps each day and working on steps from the days past. Finally it is time to put all of the choreography that we have been working on with each class together in “dress rehearsal.” As teachers, it is so rewarding to see what the kids have been learning in their classes and how they connect with different movement styles. The smiles on the students’ and teachers’ faces alike is proof that moving together, regardless of language barriers, creates unmatchable joy and community among people. I cannot wait to see what the show tomorrow will bring! So interesting,and so rewarding for all,dancers,and students. 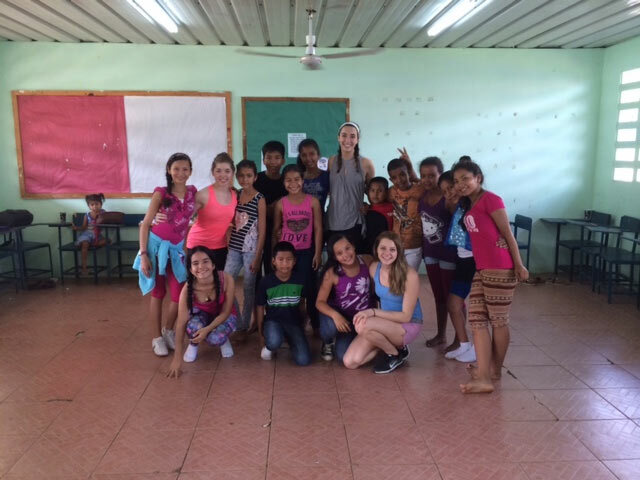 My favorite part: “The smiles on the students’ and teachers’ faces alike is proof that moving together, regardless of language barriers, creates unmatchable joy and community among people.” Thank you for sharing Brenna! Missing you in Panama!